A total of twenty-four tales, each linked to another by at least three literary elements such as character and setting and theme, make up this first-of-its-kind anthology by writers from Texas and the Carolinas. The short stories in A Shared Voice include twelve anchor tales—six by writers from Texas and six by writers from the Carolinas—and twelve original works of fiction written in response to the anchor narratives. The result is a rich and varicolored tapestry of voices by writers who have spent their lives weaving tales. The 12 Texas writers are Clay Reynolds, Oscar Casares, Robert Flynn, Stephen Graham Jones, Jim Sanderson, James Hoggard, Jan Epton Seale, Jerry Bradley, Betty Wiesepape, Terry Dalrymple, Laura Rebecca Payne, and Dave Kuhne. The 12 Carolina writers are Jill McCorkle, Ron Rash, George Singleton, Bret Lott, Elizabeth Cox, Michael Parker, Randall Kenan, Elise Blackwell, Marianne Gingher, Cecile Goding, Phillip Gardner, and Deno Trakas. Published by Lamar University Press in 2013 and co-edited with Tom Mack, A Shared Voice is Andrew Geyer's first edited anthology. This collection of twenty-four linked fictional narratives by writers from Texas and the Carolinas explores the cultural, geographical, and historical connections between these "bookend states of the Old Confederacy." Dramatic monologues, fictions that take the form of essays and professors’ responses, tall tales in the tradition of Twain, frame stories a la Irving, stream of consciousness narratives, all of these and more are here—and the quality of the writing is breathtaking. 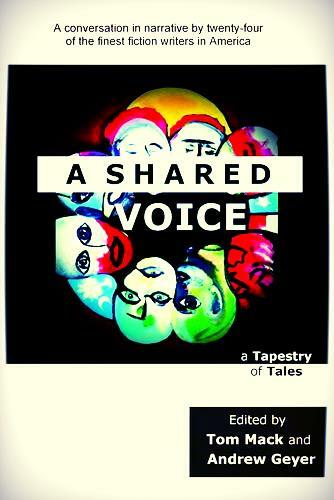 A Shared Voice was a finalist for the Foreword Magazine Book of the Year Award in the Short Stories category. "Gethsemane," by Clay Reynolds, the opening story in the collection, was a finalist for the 2014 Spur Award for Best Short Fiction from the Western Writers of America.